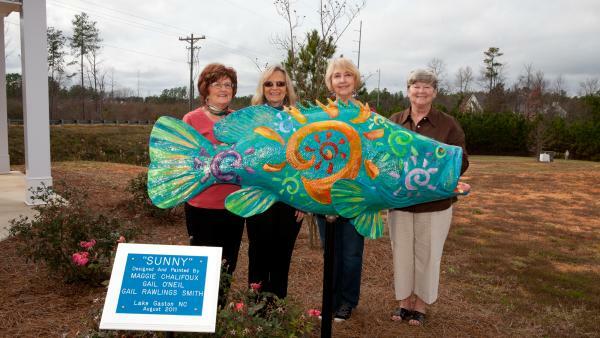 OSAIL selected Lake Gaston artists Gail Smith, Gail O’Neil, and Maggie Chalifoux to design and paint the fish. The fish started as a five foot fiberglass moulded rockfish; a blank slate for the artists. The artist team collaborated on a number of designs for the fish, and finally decided on one using sun symbols and bright lake colors. The artists named him "Sunny" for the sun symbols. Layers of paint and glazes were applied using various artist techniques and materials, and using the sun patterns. The artists achieved a beautiful, shimmery, glistening effect for "Sunny". From there he was coated for weather protection and mounted on a pole and installed. The result is a bright, cheerful work of art reflective of the Lake Gaston community. "Sunny" is located at the OSAIL kiosk at the Food Lion in Littleton. Stop by and see him up close.